Come spring 2009 and these beauties from some of the world’s best-known fashion brands will be in stores. choose which label you want to sport. Price: Rs 20,995 The embossed leather gives an extra kick to the classic feel of this Emporio Armani watch. It has a dark brown leather strap with a stainless steel square case. The brown dial with silvertone Roman numeral, logo, and three subdials make it not just a funky-looking timepiece but a great one to have when crossing time zones. This quartz watch is waterresistant up to 30 m and comes with a two-year warranty. Price: Rs 36,990 Imagine a watch that comes with diamonds and is still priced under Rs 40K! The stainless steel case with genuine diamonds at the 6 and 12 hours makes it a special watch. The warm grey dial with silver indexes and the pewter leather embossed croc strap are great pluses. This watch comes in a special Emporio Armani box. Price: Rs 25,495 Based on the limited edition commemorative Meccanico watch launched in 2007, this new model is in a stainless steel version with a black calf-leather strap embossed to resemble crocodile skin. The black dial has a special feature referred to as “open heart”, which reveals the mechanical functioning of the watch movement, making the inner workings visible to the wearer. Price: Rs 7,795 The DZ1199 has all of the Diesel charm that you would expect with the large oversized dial. The use of small screw heads at the four corners makes it look like a piece of art rather than a watch and it is this unique style that will make it a real winner this season. It has a square shape black dial with a leather strap and a quartz analogue movement. It’s water-resistant up to 50 metres. Price: Rs 9,795 The powerful yellow crystal stands out brilliantly with a three-link bracelet fitting against the case. It has a silver dial with yellow mineral crystal and a silver second hand. Price: Rs 8,795 With this stainless steel men’s watch, precision quartz timing is merged with a patented mechanical dial to create a not only functional, but stunning timepiece. It has a steel bracelet with folding clasp closure and is water-resistant up to 50 metres. Price: Rs 25,290 This elegant ladies watch from the Armani Ladies’ Classic line will never go out of style. 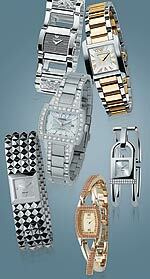 Slim watches in stainless steel, silver and gold will give any woman an air of sophistication. It comes in a stainless steel curved rectangular case with a cream dial. There is a stainless steel adjustable-link bracelet with a deploying buckle. It is waterresistant up to 53 (approx.) metres. This chic Emporio Armani ladies watch has a lucid steel bracelet, featuring the brand’s logo in crystals. The discreet clasp closes with pressure. The rectangular steel case features a grey anthracite quadrant and mineral crystal glass that is scratch-resistant. The band is gold-plated. The watch is water-resistant up to 30 metres. Price: Rs 6,495 This is a sparkling ladies watch with crystals round the bezel and a mother of pearl face on the bracelet. This watch comes with a shiny silver bracelet and a silver dial three-hand movement. Price: Rs 34,495 This jewellery inspired bracelet cuff consists of diamond-encrusted stainless steel. The padlock-shaped case features a tonal dial, indices and the Burberry logo. It’s also available in stainless steel, 18 carat gold-plating or dark nickel colour-plating. Price: Rs 54,995 This watch comes in a stainless steel case and is held together by a four-strand pyramid stud bracelet. The case features a tonal dial, with diamond indices and the Burberry logo. It’s also available in dark nickel colour and 18-carat gold-plating. Price: Rs 8,995 This DKNY crossover ladies watch features crystal stones all around the dial, case and bracelet. The bracelet strap has selfremovable links so you can adjust the length of the bracelet yourself.